Services on site | OUTLETCITY METZINGEN! What are the ingredients for a perfect shopping experience? What brings a smile to our visitors' faces? Here at the OUTLETCITY METZINGEN, we ask ourselves these questions every day. After all, each of your visits to us should leave you feeling happy and content. Are you tired of endlessly searching for somewhere to park? 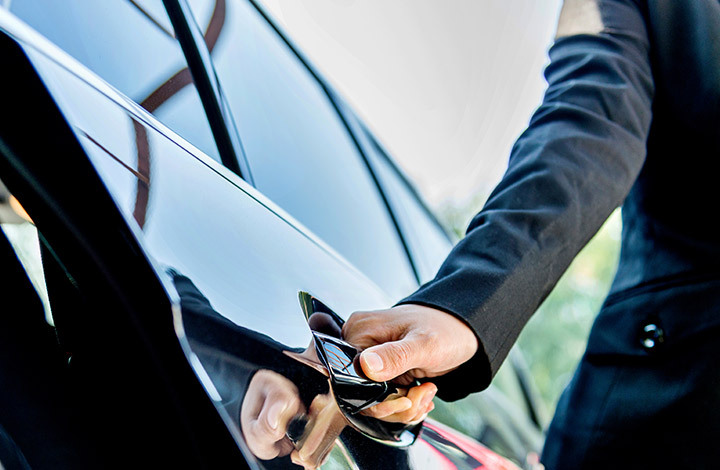 We have over 3,500 parking spaces for you to choose from. 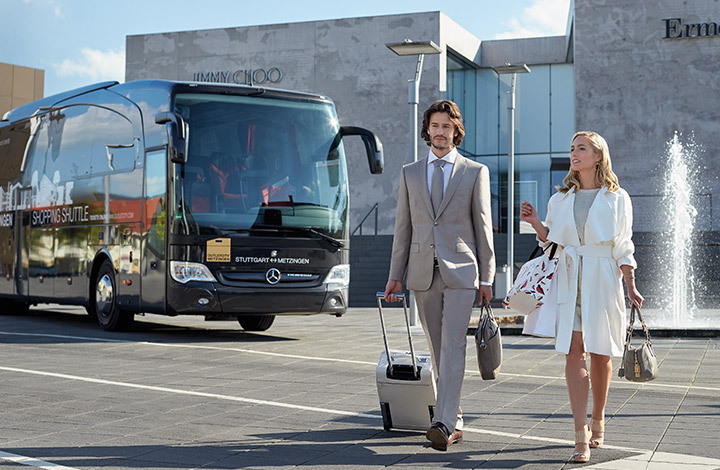 Or why not try the direct Shopping Shuttle bus from Stuttgart? Would you like VIP service or personal shopping advice? Take advantage of our attentive childcare in the Kids Camp or our free Wi-Fi if you want to stop for a break. Don't worry about your baggage or shopping. With our numerous lockers, you can be sure everything is stored securely. In short: you can simply have a great day at the OUTLETCITY METZINGEN. Or even two. We're always here for you! WHEN TAX-FREE SHOPPING MEETS "COULDN'T BE SIMPLER"
Have you found what you're looking for in our outlet stores and come to us from a country outside Europe? Then your visit has double benefits, as it's very easy to shop VAT-free in the Outletcity Metzingen! Staff in each of our shops will be happy to help you: simply ask for a tax-free shopping form and ask the assistant at the cash desk to fill it in. Whether you've come from Dubai or Degerloch – it's always worth calling in at the central Tourist Information on Lindenplatz. From hotel and restaurant recommendations to times for connections and flights, or tracking down a lost umbrella: our friendly multilingual staff will give you all the information you need, our handy shopping and tourist guide, as well as exciting tips for leisure activities in the region. Come and find out what we've got in store! Would you like to give a special someone the gift of a special shopping experience? Our gift card for over 70 luxury and premium brands is guaranteed to make their eyes light up. And maybe to set the scene for an unforgettable shopping day together! When "I'm bored" turns into "Can I stay a bit longer? ", it means another little one has had a great time in our Kids Camp. Simply make your next visit to us a family outing and browse our stores at your leisure while your little ones have fun in our professional childcare facility. From arts and crafts to fun group games and exciting table football, through to face-painting and balloon modelling at special events - your child will never get bored in our Kids Camp! When the whole world of exclusive brands comes together with your own personal look, it could well have something to do with our style and shopping advice service with professional fashion experts . Treat yourself to a very special shopping experience, brush up your fashion-consciousness and quickly find the perfect outfit for any event. From €375 per person, your personal shopper will help you find inspiration from over 70 premium and luxury brands, while keeping your own individual style at the forefront. As a special gift or a day out together, it offers a fantastic opportunity to combine attractive outlet prices with individual premium service. Try it for yourself! OUTLETCITY Metzingen has a prayer room designed specifically for the needs of its Muslim visitors. Men and women can pray separately here. Prayer rugs, copies of the Quran and separate washrooms are also available. The prayer room is open to the public during OUTLETCITY METZINGEN’s opening hours, and is located in the same building as the s.Oliver store on Mühlstraße 1. The entrance to the prayer room is at the back side of the building. Take the lift to the third floor to find it.